By Tim Royner: Eddie Hearn confirms he has an agreement between Oleksander Usyk and Carlos Takam to face each other next in a fight on DAZN on May 17 or May 18. As of now, the Usyk-Takam fight is tentatively scheduled for May 18. However, Hearn is thinking of potentially moving the fight to May 17 in order for it not to bump up against the May 18 fight between WBC heavyweight champion Deontay Wilder and Dominic Breazeale on Showtime Championship Boxing, Hearn told IFL TV. Hearn also wants to match Usyk (16-0, 12 KOs) against former WBA heavyweight champion Alexander Povetkin later this year. That would be an interesting fight between two Olympic gold medalists. It’s unclear how many fights Usyk will be taking at heavyweight before Hearn matches him against IBF/WBA/WBO champion Anthony Joshua. That’s the fight that Usyk have moved up in weight to take. He wants to beat Joshua, and unify the division. It may not matter how many tune-up fights Usyk takes, as he’s going to be over-matched when it comes to the size. With Usyk’s goal being to take on the giant 6’5″ Joshua and 6’7″ Wilder, it would be better for him to be matched against taller heavyweights. Takam and Povetkin are both on the short side at 6’2″, and they’re nowhere near as big as Joshua and Wilder. Takam (36-5-1, 28 KOs) is an excellent option for Usyk’s first fight at heavyweight. 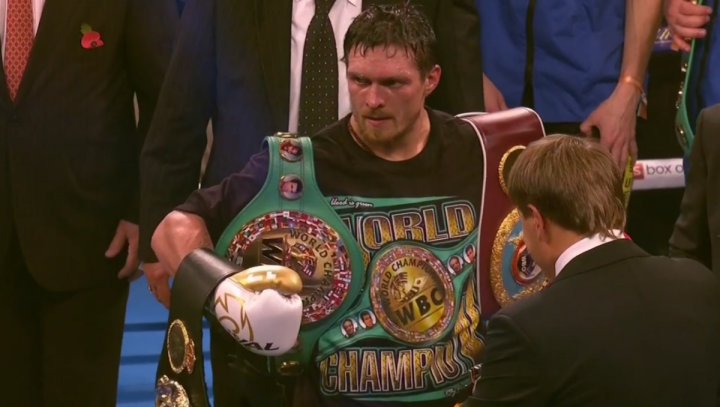 Usyk, 32, is moving up from the cruiserweight division where he recently unified in winning all four of the titles. Hearn kept Usyk busy with a fight last November against former WBC champion Tony Bellew, who Usyk stopped in the 8th round in an exciting fight in Manchester. The 38-year-old Takam has suffered losses to Dereck Chisora, Anthony Joshua and Joseph Parker in the last few years. Takam was competitive in all three of those fights. He was beating Chisora through the first seven rounds before getting stopped in the 8th round last July. Takam gave Joshua all he could handle before being stopped in the 10th round. Usyk has the skills and the mobility to keep Takam from landing his big shots. It could be interesting if Takam is able to connect with his punches. He’s got respectable power, and he’s capable of throwing a lot of shots. That’s what Takam is known for. Five years ago, Takam beat Tony Thompson by a 12 round unanimous decision in a one-sided fight. In Takam’s next fight, he was stopped by Povetkin in the 10th round. Takam caught Povetkin when he was fighting at a high level, and he wasn’t able to deal with his boxing ability, combination punching and his power. Povetkin hasn’t looked that great lately though. If those two were to face each other now, it could be a toss up.